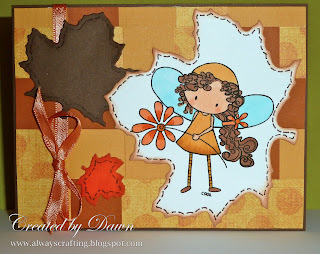 Autumn is in full swing here so I made a fall card using the color changing leaves that are all over the place here as a jumping off point for my card. I used an image from Tiddly Inks that was made I think meant as a spring image but I changed it to a fall image. I created the background on this card using a basket weave effect. The final look is so cool but easy to create. You just cut three different sheets of cardstock into strips and weave them together to create this basket weave look. Using a backing cardstock helps to stabilize the woven strips. Then cut to the size you need. very pretty card! I love that image and your coloring is great! Love the leaves too! A beautiful fall project! Thanks so much for joining us at Tiddly inks this week! Wow this is a beautiful card. Love the fall colors and that you placed her on a leave too! Thanks for joining us at Tiddly Inks! I love this little autumnal project hun, and I love how you made the bugg work for you!! thats fab!! A very adorable card! I love that you added the bug on a large leaf, so cute! Thanks for joingin us at the Tiddly Inks challenge this week. How cute to put her in a leaf cutout, great idea! Thanks for playing along at Tiddly Inks this week!